These configuration files reset to factory defaults and then set parameters for networking and DVB-S2. If the SR1 is already set up with different network params, they will be lost. You don't have to rename .cfg file anymore but do unzip each zip file into a separate, empty folder. 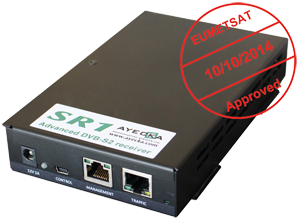 Updated SR1 config file for receivers shipped without DVB-S2 settings. This version will not change your network settings. Force save of all settings with a warm reset. No reset to factory defaults, no changes in network settings. Works on SR1 receivers with 2 RX channels and on SR1 receivers with single RX. Tested on software versions 232, 243 and 250. It does not reset other settings like network so it can also be used if a user has messed up DVB-S2 settings. If a receiver has been programmed using either config file above this 3rd config is of little use but it won't do any harm. For all 3 files (and all SR1CFG.EXE) you need a working USB connection with the SR1. David Taylor has included brief instructions in the upload of the SR1 Console utility.